Our customers represent the heart and soul of the energy industry – the independent oil and gas producer – focused on finding and developing oil and gas reserves. Our expertise is in everything that occurs after you find it – infrastructure design and construction, pipeline tie-ins, price discovery, pricing options, gathering-processing-transportation, nominations-balancing-allocations, accounting. Small to mid-sized independents have discovered the benefits of leveraging Marabou’s expertise and personal attention, and are realizing an improved bottom line through higher netbacks and reduced administrative costs. 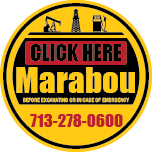 Contact Marabou today and allow us to perform a no-cost, no-obligation analysis of your current sales, gathering and processing agreements to determine if we can add value to your current marketing efforts. Odds are we can.